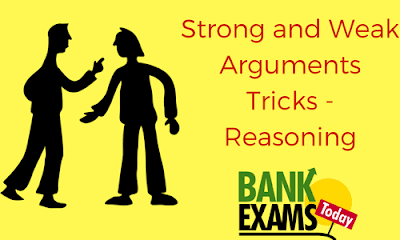 Some competitive exams consist of questions based on identifying strong & weak arguments. In these questions, a proposal followed by two arguments is given. One has to examine the arguments in the framework of the given proposal so as to determine their strength. The statements given in these questions usually are of interrogative nature. Let us discuss two important concepts, “Proposal” & “Argument”. Most of the questions are built on a “proposal”. A proposal here is nothing but a sequence of action to be taken up. A proposal is followed by two arguments. An argument may be in favour of or against the proposal. One has to check the strength of the argument. This cannot be misconstrued as considering only favourable arguments. It is irrelevant whether an argument is favourable or adverse to a proposal. Both favourable & adverse arguments are considered provided both of them are strong enough in their own ways. The supporting argument normally bases its support on a positive result or a positive feature which would follow, on implementing the course of action proposed in the statement. The opposing argument takes its support on the basis of a negative result or a negative feature that follows if the proposed course of action is implemented. An argument is considered to be strong, if it provides a valid & directly related reason either in favour of or against the proposal made. The argument is to be considered true, unless it is opposing the generally accepted facts. In other words, the authenticity of the argument cannot be questioned as long as it is not against established facts. For Example- If one argument suggests that Mohamed Ali is stronger than Mike Tyson, we have to take it as true. Personal opinion about the proposal shall be ignored. Even if one has an opinion about the proposal, in the discussion it cannot be taken into consideration. In other words, the judgement should always be unbiased. Sometimes one may come across a situation in which an argument [say “India should declare war against the whole world”] is absurd. But if it is strong enough in the given context it has to be taken as a strong argument. One cannot deny this argument terming this as absurd. To determine the strength of an argument, one has to follow a methodical way which is explained below. The argument should have clarified in the reason suggested in it. The argument should be contextual & express its support or opposition to the given statement in explicit terms. Statement- Should India wage war against Pakistan? Argument- No, both India & Pakistan are at fault. Here, though the argument refers to the subject in the statement, it has no clarity. We cannot find out what the argument wants to say. Thus, the argument is ambiguous. The reasons given in the argument, in support or against the given statement, should be comparable to the magnitude of the situation given in the statement. It should be neither same as “trying to kill an elephant with a needle” nor “trying to kill a mosquito with a sword”. Statement- Should every citizen be asked to use only pencil to write instead of pen? Argument- Yes, usage of pencil leads to reduction in wastage off paper. This helps in protection of environment. The argument links usage of pencil to protection of environment, because errors can be rectified on the same paper instead of using a new paper & hence wastage of paper can be reduced. This measure, in practice, makes little difference to the environment; hence, the argument is rejected. The argument should relate its reasoning to the context given in the statement. Statement- Should the syllabus for primary classes be reduced, to enable the students to understand the concepts piece meal? 1) No, it gives more leisure to students, which may lead to juvenile delinquency. 2) No, the syllabus should include subjects that help in increasing IQ levels of students. In the given statement, a course of action is suggested to achieve the ultimate aim of enabling students to understand the subjects better. The arguments should base their reasoning as to whether the suggested action results in achievement of the ultimate aim or not. The reason given in argument (1) is out of context when compared to the statement. Hence, this argument is irrelevant. Argument (2) has relevance to the above statement as it reasons on the same lines as the statement. The statement should include whatever it wants to achieve through the suggested course of action. The argument should suggest why or why not the planned action be implemented, basing on favourable or adverse results that follow after implementation. But it should not support or deny the suggestion, because such action has been taken up or not taken up elsewhere. Statement- Should India reforms its taxation policy? 1) Yes, it helps in rationalization of taxes. 2) Yes, many countries are doing so. Argument (1) is a valid argument because it is based on a positive result that would follow the suggested action. Argument (2) is not based on any resulting effect of the suggested action. It is only comparing with other countries. Others may have their own reasons for taking up such measures. Hence, this is not a valid argument. These kinds of arguments, though they are related to the statements, make a simple assertion or there is no substantiation to strengthen the argument. 1) Yes, it should be done immediately. 2) No, it is not going to help. Argument (1) simply suggests that it should be done immediately, but does not give any reason as to why it should be done. Hence, this argument is too simple. Argument (2) does not show how it is not going to help. Of course, it has shown a reason why such an action should not be taken up, but does not dwell deep into the reason. Hence, the argument (2) is also simplistic. 1) If only statement I is a strong argument. 2) If only statement II is a strong argument. 3) If either I or II is a strong argument. 4) If neither I nor II is a strong argument. 5) If both I & II are strong. Statement: - Should there be a law to punish parents who get their minor children married? Statement: - Are there any good politicians left in this world? I. Yes, so many underprivileged people are sustaining themselves & improving economically. II. No, there is nothing in this world which is fully good or entirely bad.